Riad El Mansour Location. 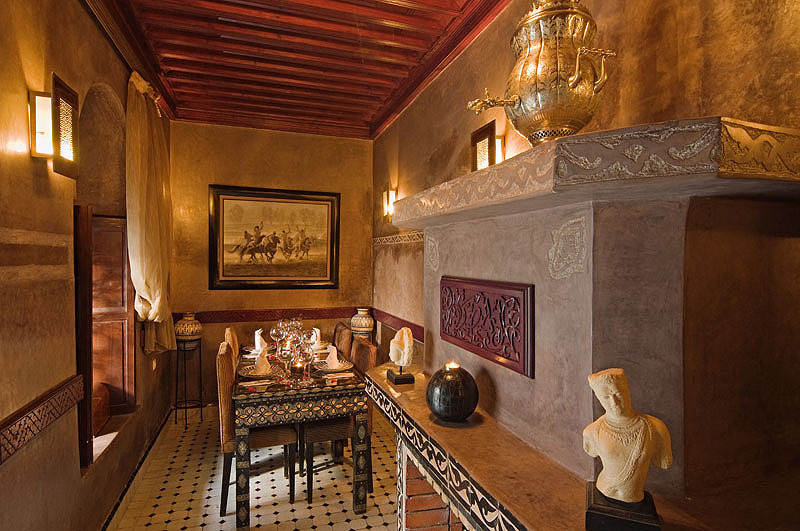 Book Riad El Mansour Today with Hip Morocco - Holiday Accommodation in Marrakech, Morocco. 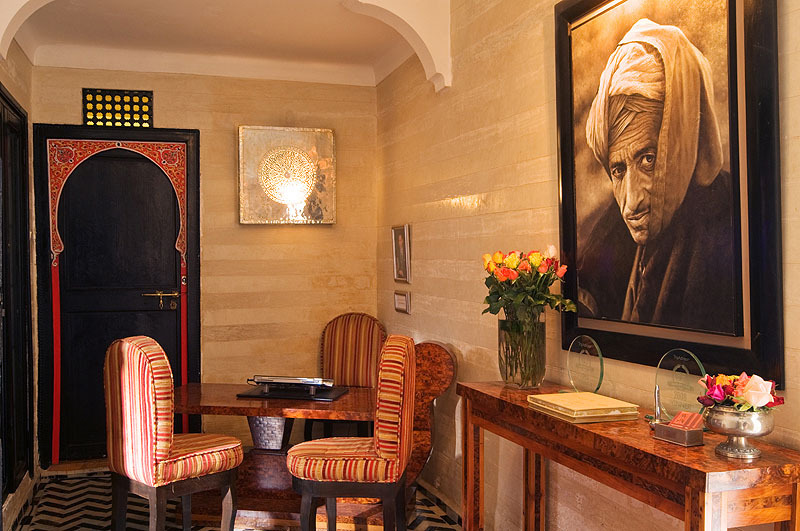 "The opulence and ambiance of a bygone era..."
Riad El Mansour is an oasis of tranquility and serenity, holding to true tradition of Marrakech, which once provided rest, relaxation and rejuvenation for the caravans coming out of the Sahara desert. 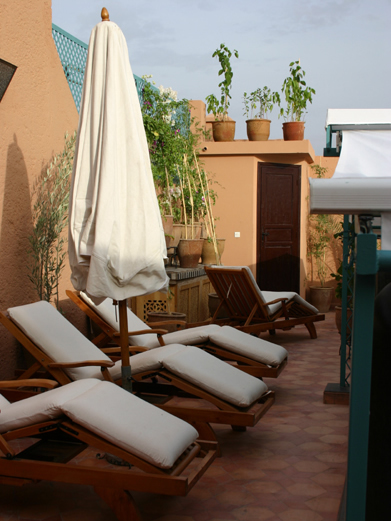 The riad has been tastefully and lovingly restored with great attention to detail. 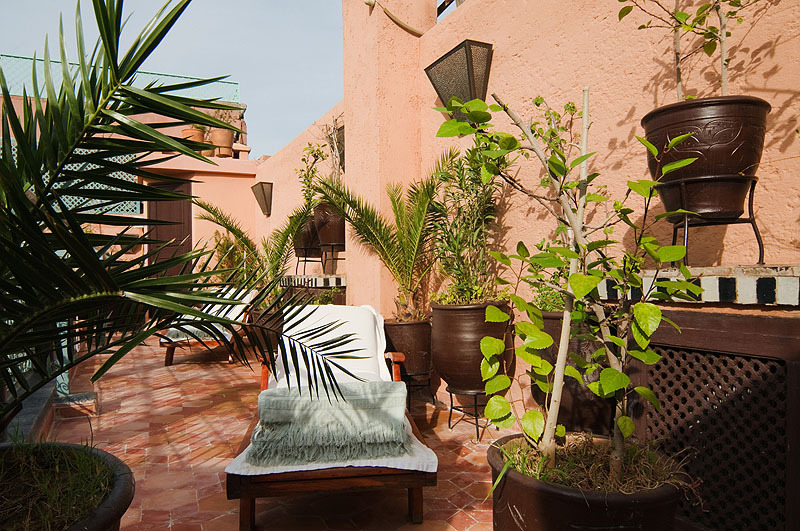 Decorated with the finest traditional materials, exclusive, hand-crafted furniture and contemporary Moroccan art which complement the traditional stucco work and architecture. 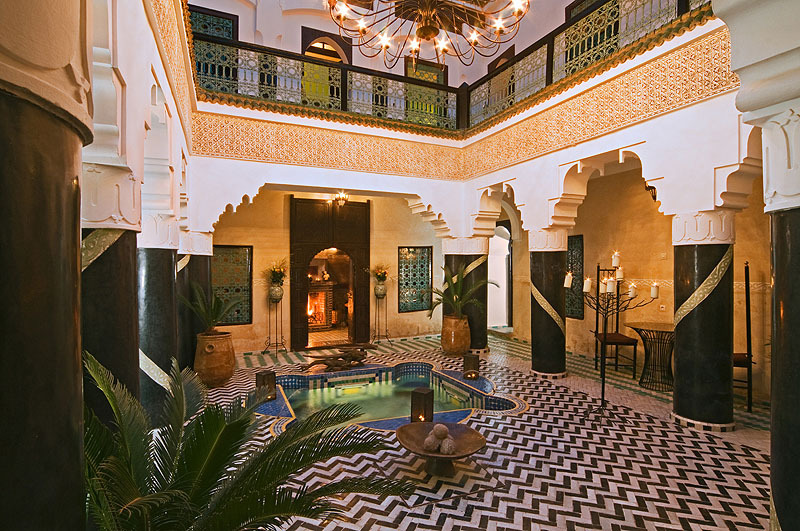 At Riad El Mansour, you may choose to work out in the gym, refresh yourself in an azure Jacuzzi/plunge pool, treat yourself to a hammam, or indulge at the Spa with the riad's exclusive Osteopath/Acupuncturist and luxurious massages in pure Moroccan tradition. 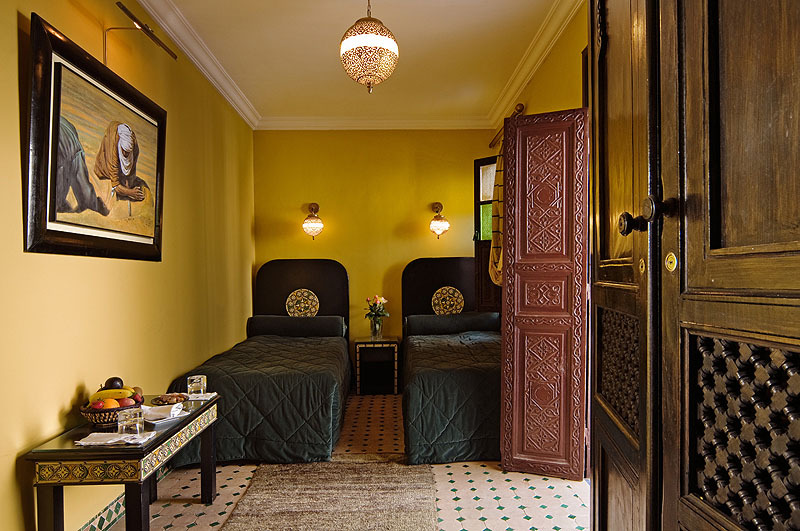 Each bedroom at Riad El Mansour is furnished with hand-made mattresses, your choice of pillows, plus luxury cotton sheets, plush towels, luxurious bathrobes, slippers and exquisite hand-crafted toiletries. All rooms and suites are refreshed daily with complimentary fresh flowers, mineral water and fresh and dried fruit. 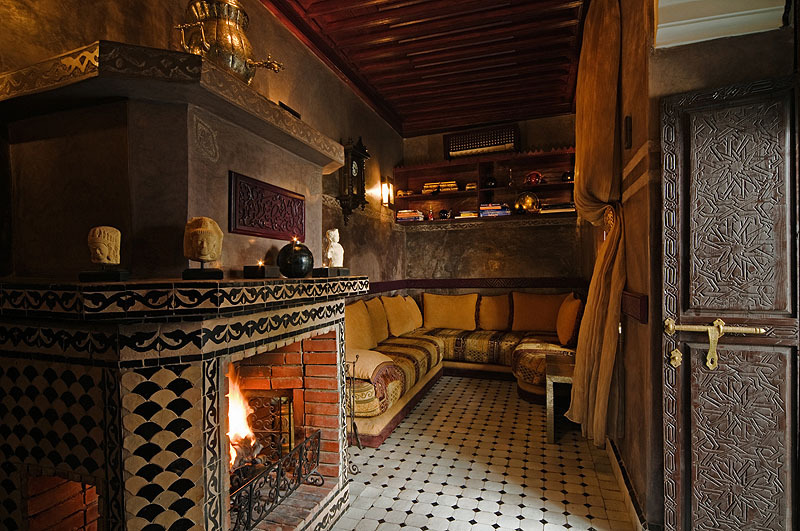 Following in the Moroccan tradition of hospitality, food and drink have always been essential pleasures for guests at a riad. 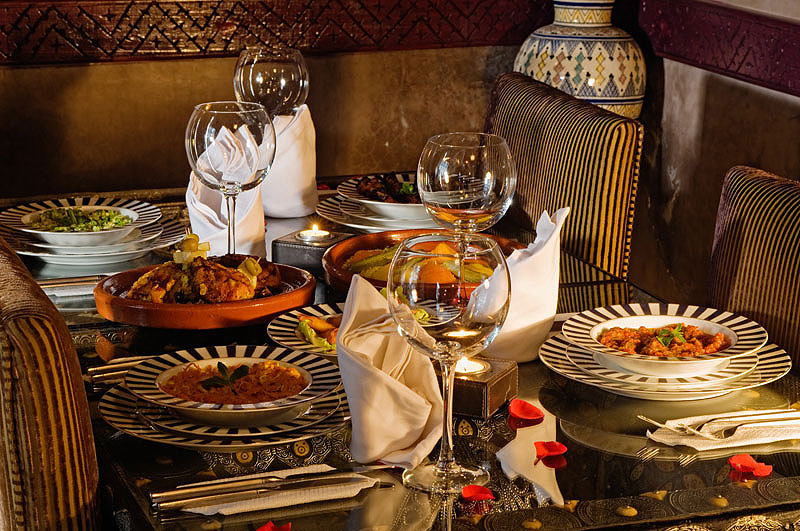 At Riad El Mansour, this culinary tradition continues with excellently prepared traditional cuisine using only the freshest ingredients, supported by a carefully selected wine list. Throughout the day we offer a barbecue, snacks and light meals on the roof terrace. Dinner will be served wherever you please - in one of our salons, in the secluded candlelit courtyard, on the terrace, or in the privacy of your room or suite. Our intimate lounges and the roof terrace, where you can enjoy the cool breezes and stunning views of the Atlas Mountains, are perfect settings for relaxing pre-dinner drinks. 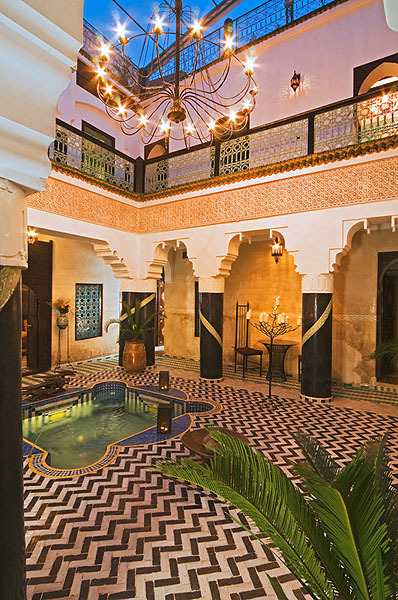 Please note that in order to retain the tranquility at Riad El Mansour, children below the age of 10 years would not usually be accepted, unless included in the party of a Whole Riad booking. Following in the Moroccan tradition of hospitality, food and drink have always been essential pleasures for guests at a riad. At Riad El Mansour, this culinary tradition continues with excellently prepared traditional cuisine using only the freshest ingredients. Commencing with an all you can eat Breakfast, taken whenever you wish, any time of the day, served on our open terraces where guests are treated to freshly squeezed orange juice, and an array of delicious food. Wake up in the morning to our home made cakes, Moroccan pancakes and other delectable pasties accompanied by steaming coffee or tea, fresh farm eggs, cereals, yoghurt and fresh fruit salad. Continuing throughout the day we offer tea and Moroccan pastries, barbecue, snacks and light meals such as salads, sandwiches and small tajines. Dinner is our speciality where our chef excels in preparing home cooked Moroccan three course meals, whether it be meat, fish, or vegetarian, you will not be disappointed, dinning wherever you please - in one of our salons, in the secluded candlelit courtyard, on the terrace, or in the privacy of your room or suite. Our intimate lounges and the roof terrace, where you can enjoy the cool breezes and stunning views of the Atlas Mountains, are perfect settings for relaxing pre-dinner drinks and a perfect start to your evening. 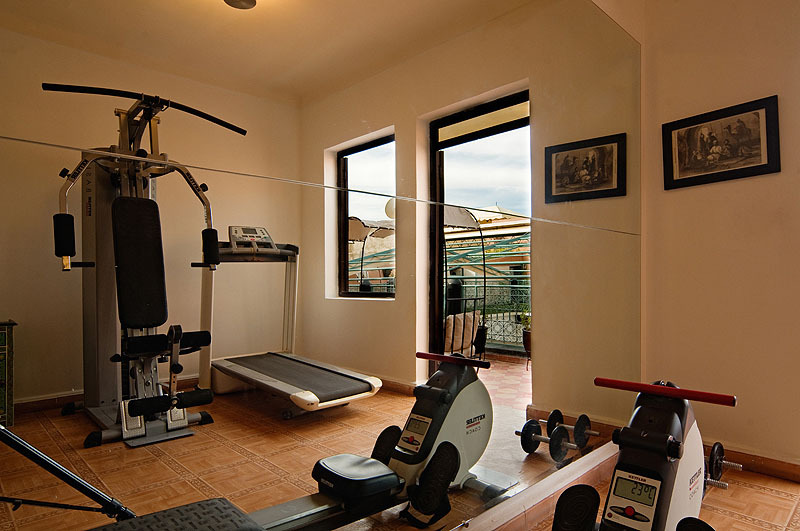 For your pleasure and most importantly, your convenience, we have a roof top Gym, Jacuzzi, Spa and Hammam. 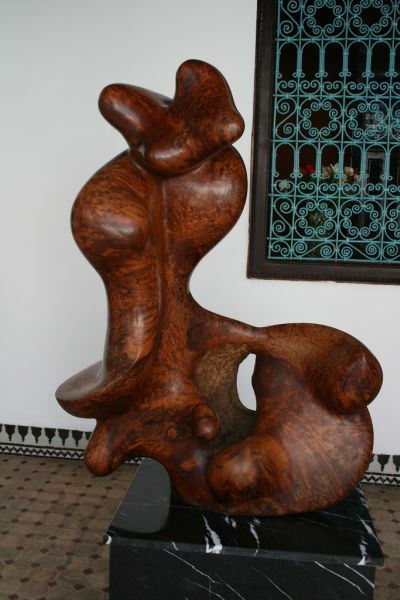 We are only a short walk to the Majorelle Gardens, Ali Ben Youssef Medersa and the Museum of Marrakech. 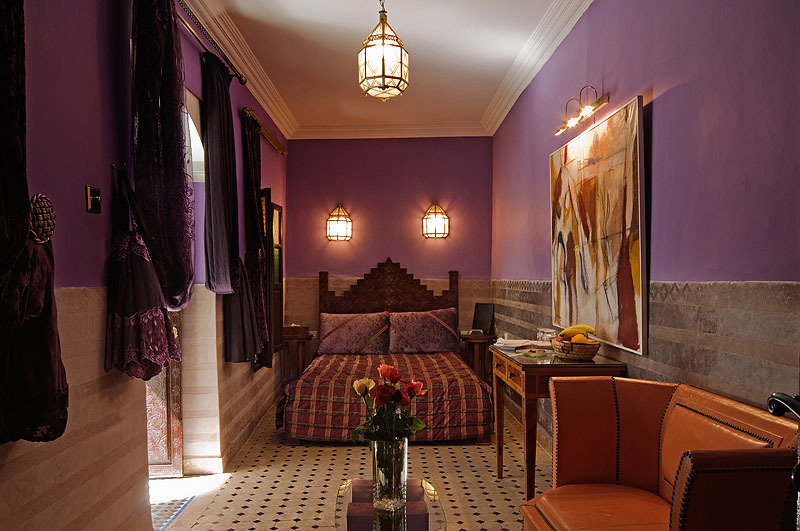 "The Riad itself was a haven of tranquility and authenticity from the maddening crowds and can one say more about the quality of the food, the beautiful rooms and helpful staff? We especially enjoyed the breakfasts on the terrace every morning. Home made yoghurt, moroccan style omelette, fresh orange juice and breads...to die for. 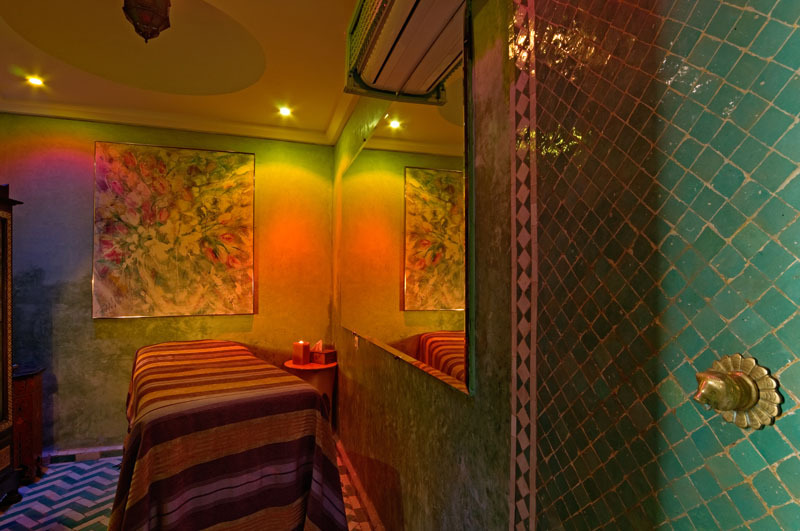 Robert the owner and the rest of his staff went out of their way to accommodate us time and time again." "We stayed here for Christmas and thoroughly enjoyed it! The rooms are cleaned twice a day, with free water, fruits and nuts and include breakfast! The staff are extremely friendly and helpful, with restaurants advice, taxis and booking! 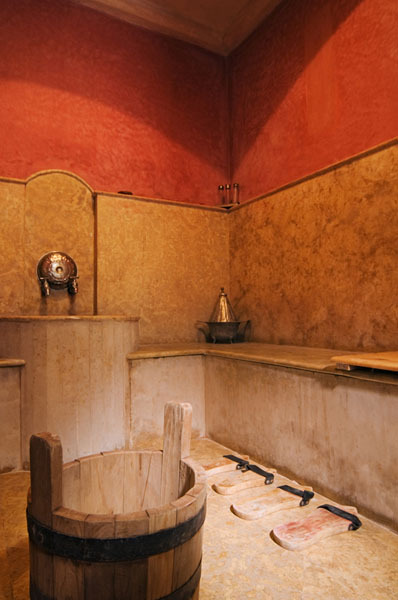 There is also a hammam, which is fab! We eat here two nights and the food was great! All in all we really enjoyed our stay!" "Regardless of the time of day you were always greeted with a smile and on returning to the Riad from our explorations there was always an interested enquiry about what we had been visiting/doing, The staff arranged an excursion for us to the Ourika Valley and were helpful and friendly throughout our entire stay." 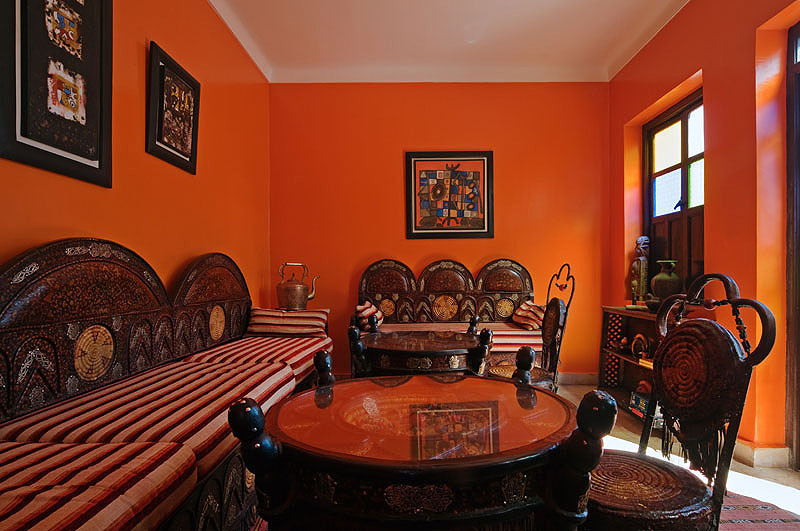 Riad El Mansour is situated a short stroll from the vibrant and pulsating Place Jemaa el-Fna. 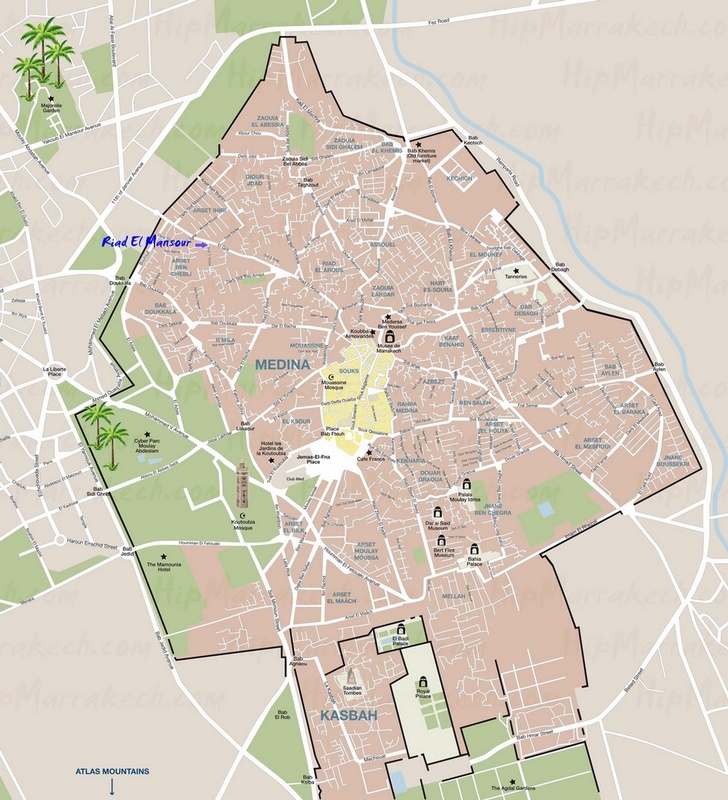 The world heritage site at the heart of the legendary 'Rose city' of Marrakech. The Amethyst Room has an Art Deco feel that is decorated in lilac and aubergine, highlighting the exquisite marquetry of the hand-crafted, mother of pearl inlay Thuya wood furniture. This ground floor room incorporates a large ensuite bathroom with shower. The Jasmine Room at Riad El Mansour is painted in a delicate silver grey and dressed with lush golden fabrics to highlight the modern Moroccan decor. This room incorporates an ensuite bathroom with shower. 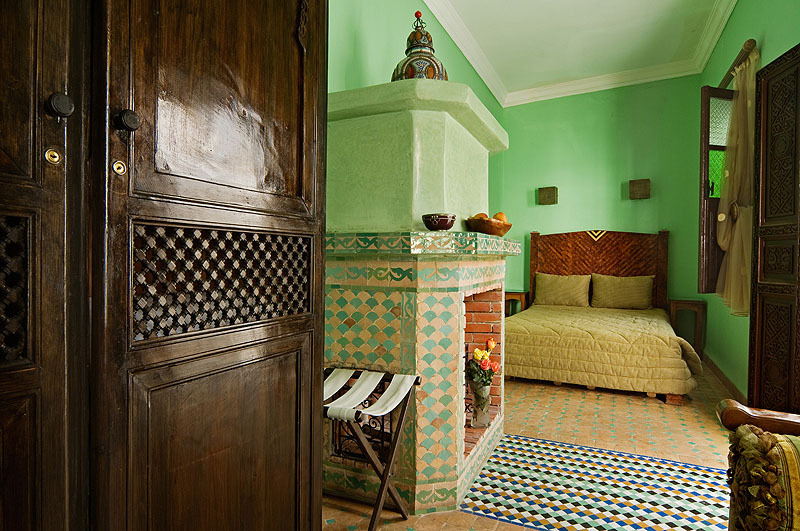 The Verbena Room at Riad El Mansour is decorated in green and gold incorporating a three-sided fireplace that divides the sleeping, and living areas. It has a flat screen television, and is furnished with hand-crafted Thuya wood inlaid with lemon and ebony. It incorporates a large ensuite shower. The Jonquil Room is decorated in yellow, with ebony furniture inlaid with camel bone and silver. The room is equipped with two single beds that can be turned into a king size bed with a pull of a zipper as required. This room incorporates a small ensuite bathroom with shower. The Azure Room is adorned with a crystal chandelier, and decorated in majestic blue and shades of sunshine yellow. 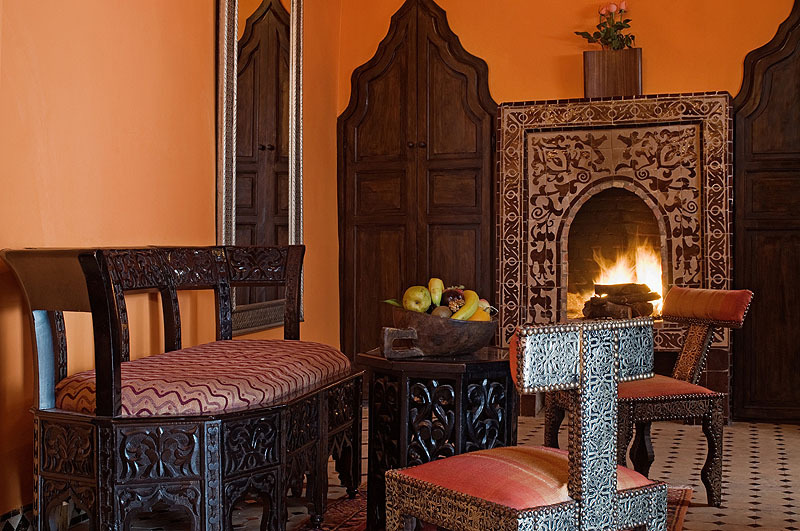 The furniture is hand painted with local motifs. This room incorporates a large ensuite bathroom with shower. 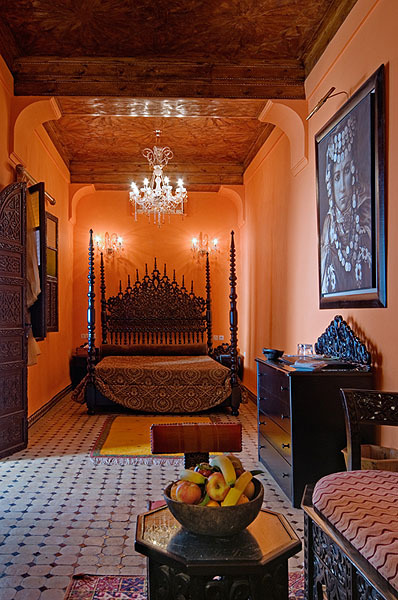 The Amber Suite at Riad El Mansour is decorated in hot desert orange, with crystal chandeliers cascading down to the stunning ebony crafted, Gothic style furniture. The seating area incorporates a fireplace and flat screen television. There is a large ensuite bathroom with shower. 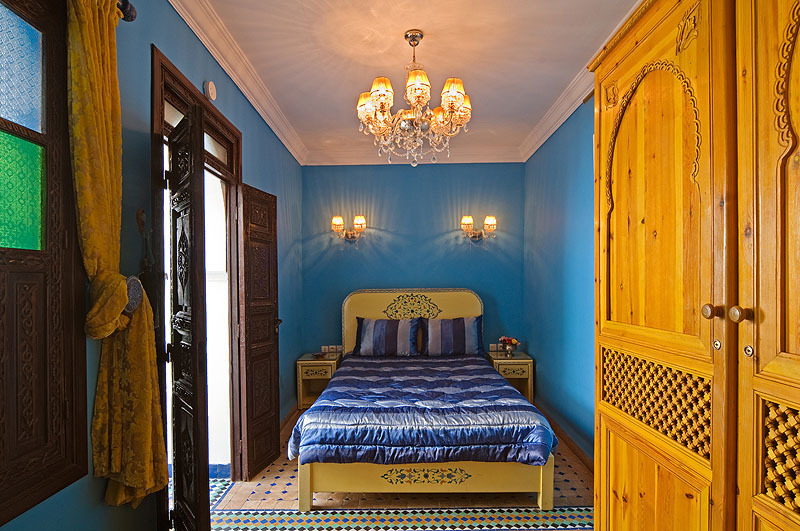 Riad El Mansour is available exclusively, with use of the the five Double Rooms, decorated in a palette of glorious Moroccan colours, and the stunning Suite, accommodating up to fifteen guests. *A minimum stay of 3 nights is preferred. 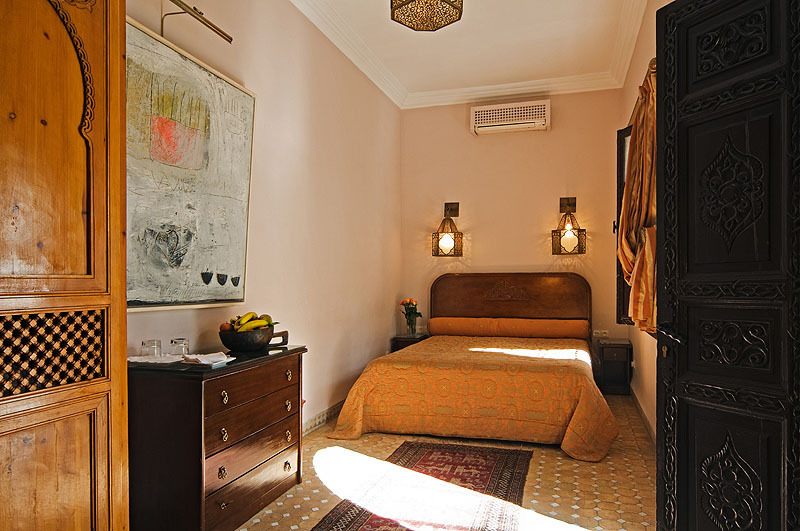 The base rate price at Riad El Mansour is in pounds, euros, or Moroccan dirhams and exchange rates are approximate.